Ginebra San Miguel just announced today its big reveal that will be the face of Ginebra. The latest Ginebra Calendar Girl for 2017 has just been named. Kim Domingo is Ginebra San Miguel latest Calendar Girl. 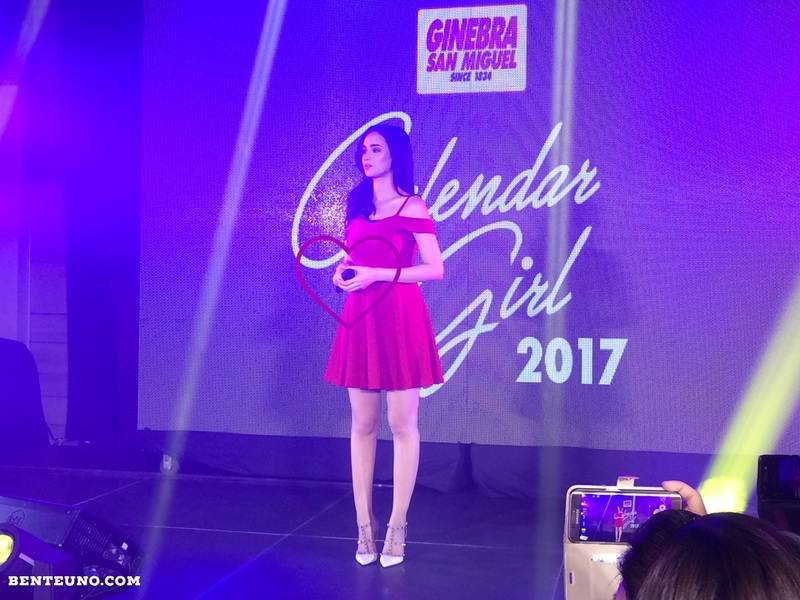 Kim Domingo, who's career keeps on rising, was named as Ginebra San Miguel's Calendar Girl for 2017. This is one of the biggest feats of this rising star so far, after her recent exposure on a men's magazine then now a mainstay at the longest running comedy tv show in the Philippines, Bubble Gang. She's one good example of Drake's "0 to 100...started from he bottom, now we're here". “Even when I was younger, I already had specific goals in life; I knew what I wanted to be and what I wanted to accomplish. Being an only child, I also learned to be strong and independent early on. I’m very grateful that my hard work and perseverance are starting to bear fruit now. So for our ka-barangays, I just want to send a message that if we remain strong, focused and ‘Ganado sa Buhay’, we will be able to achieve our goals and dreams,” Kim said. Being the bread winner then and still now, Kim keeps her feet on the ground and stays humble despite her blessings. She made a lot of adjustments and prepared hard on her biggest challenge/project so far being the Ginebra Calendar Girl of 2017. She trained, started working out and spent hours in the gym beforehand to lose weight and get fit. When you see her pictures as the latest Ginebra Calendar, you'll be amazed with the result. The big reveal of the latest Ginebra Calendar Girl was held in Sequoia Hotel, Quezon City. Arci Muñoz, the 2016 Ginebra Calendar Girl, who missed the event, send her regards to the new Ginebra Calendar Girl and wished her the best, and hoping that she'll meet the next face of Ginebra Calendar Girl to congratulate her personally. She also sent a video message thanking everyone who supported her. Another surprise is the five-layout 2017 Ginebra Calendar showcasing Kim Domingo on “Cheeky and Geeky” theme. In this sizzling hot Ginebra 2017 Calendar, Kim dresses as a baker, gamer, and even a professor. Unfortunately NSFW calendar. If you're a true Kim Domingo fan the Ginebra 2017 Calendar is definitely an item to collect. “Kim definitely personifies our marketing campaign, ‘Ganado Sa Buhay’. She worked her way up to become one of the most recognizable faces in the entertainment industry today. Her story is an inspiration to every hardworking Filipino,” Ginebra San Miguel Brand manager Paolo Tupaz said. It's a win win partnership for Ginebra brand and Kim, as Ginebra remains the no. 1 selling gin in the world, according to leading global drinks journal Drinks International. As for Kim, she's definitely one of the hottest rising star and we can't deny that she'll get to stardom level in no time. Hopefully, Kim Domingo becomes FHM's Sexiest Woman of 2017. We might raffle the Kim Domingo digitally signed Ginebra San Miguel 2017 Calendar, so watch out for further announcement(s).